KP Oli Appointed as 41th PM of Nepal - Integration Through Media ....! KATHMANDU: KP Sharma Oli, chairperson of CPN-UML and a common candidate of the Left Alliance has been appointed as the country’s 41st prime minister. 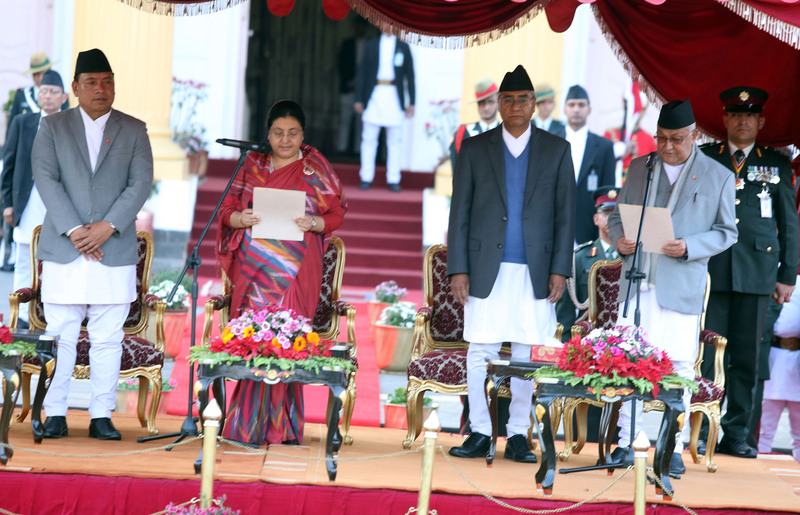 President Bidhya Devi Bhandari appointed Oli as the prime minister under Clause 76 (2). Chair Oli was elected as Prime Minister in a parliamentary vote on 11 October 2015, receiving 338 votes out of 597. Oli’s PM candidacy was supported by the UCPN-Maoists, Rastriya Prajatantra Party Nepal, and Madhesi Rights Forum-Democratic along with 13 other small parties. He was sworn in on 12 October for the first time as country’s PM. Earlier today, former prime minister Sher Bahadur Deuba had addressed the nation and later, submitted his resignation. KPDeuba had shouldered the responsibilities on June 6, 2017.
Who is KP Oli ? KP Sharma Oli was born on 22 February 1952 at Terathum, Eastern Nepal. He was the eldest child of Mohan Prasad and Madhumaya Oli. Oli was raised by his grandmother, Rammaya, after his mother, Madhumaya, died of smallpox when Oli was four.He did his primary school education in Terathum and later his family migrated to the southern district of Jhapa. He resided mostly in Jhapa during his early political life.Oli started his studies at Himalaya Higher Secondary School in Damak municipality of Jhapa district at the age of 12. He left school in grade nine. He did IA from the jail and appeared BA exam of first year only. Oli met his wife, Rachana Shakya, a fellow communist, after coming out of prison. They first met in the course of party activities and married later.Oli began his political career in 1966 in opposition to the party-less Panchayat System in place at the time.He joined the Communist Party of Nepal in February 1970. He became involved in subversive politics and was arrested for the first time in 1970. A year later he became a district committee member of the party and soon the chief of the Jhapa Movement Organizing Committee in 1972.Oli was imprisoned for 14 consecutive years from 1973 to 1987. After his release from prison in 1987, he became a central committee member of UML in-charge of the Lumbini Zone until 1990.Oli was elected as leader of the CPN-UML Parliamentary Party in the Second Constituent Assembly on 4 February 2014, defeating party chairman Jhala Nath Khanal by a vote of 98 to 75. Oli was subsequently elected as the chairman of CPN-UML in July 2014. Oli was appointed as Deputy Prime Minister as part of the interim government in 2006. He was also assigned to look into the death of fellow politician Madan Bhandari. From April 2006 to 2007, Oli was Minister of Foreign Affairs. He was elected as a member of parliament in the House of Representatives from Jhapa district’s electorate no. 6 in 1991. Soon he became the chief of the department of publicity.In the ever-changing political situation of Nepal, Oli served as Minister of Home Affairs in 1994–1995. He was re-elected to the House of Representatives from Jhapa electorate no. 2 in 1999.